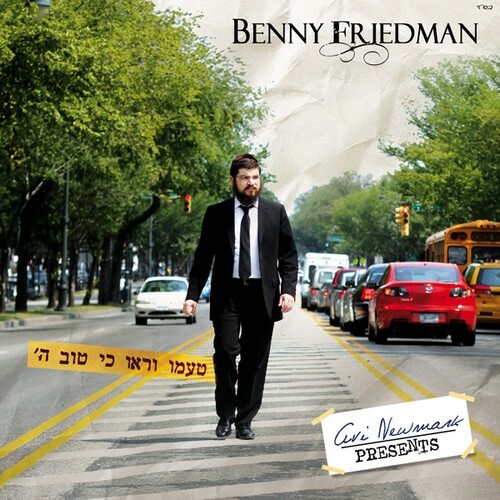 Benny Friedman’s long awaited debut album is finally here! Presented by Sameach Music and produced by Avi Newmark, this has been one of the most anticipated albums in recent memory, featuring 12 tracks sure to satisfy all musical palettes. A variety of talented artists team up to bring you this masterful musical production. Selections include compositions from such famed composers as Yitzy Waldner and Elimelech Blumstein, and relative newcomers like Meshulum Greenberger and Oriel Avraham. Arrangers range from Good ol’ Mona and Moshe Laufer to the always incredible Leib Yaakov Rigler and Avremi G, along with some great surprises from Ian Freitor, the album’s engineer. The Friedman/Marcus families showcase some very strong talent with three compositions, including the title track, Taamu, composed by Shmuel Marcus, an incredible piece of music sure to take your breath away composed by Simche Friedman, and a Bentzi Marcus composition featuring a duet with 8th Day! Rabbi Manis Friedman, Benny’s father, collaborates with Lipa Schmeltzer to compose a Yiddish lyric that will at once force you to look inward, while causing your feet to move with the beat! A special musical tribute was composed by Yitzy Spinner in memory of Izzy Taubenfeld, the founder of Sameach Music.